Ride for enough years, and you’ll experience some of the immutable truths about motorcycling: Leathers get smaller when hanging in a closet, our past racing ability improves the further we get from actual racing, and tire pressure drops when your bike isn’t ridden daily. While I can’t do anything about the first issue (except recommend diet and exercise changes) and I don’t want to change the second, as I’m enjoying my ever-expanding track exploits, tire pressure is an issue neglected by far too many riders. With five bikes vying for my attention (four test and one personal), I can’t take them all out for a daily ride. Invariably, when I test a bike’s tire pressure before a ride (You do that at least once a week, right? ), I need to add a bit of the local atmosphere. Previously, adding air involved checking my portable air tank to discover that I forgot to close the valve the last time I used it, and consequently, it was empty. So, the big compressor would get plugged in and rattle the windows in the garage while it built up enough pressure to fill the tires. If this happened late at night while prepping for a ride or early in the morning when getting ready to leave, I’d usually hear about it from my lovely wife (who you’d think could sleep through anything, considering the fact that she hasn’t smothered me in my sleep for snoring). For the past several months, I’ve had the pleasure of using a MotoPumps Mini Pro Inflator, and it has made my compulsive pressure adjusting much easier. As we noted in our selection of the Mini Pro as our Honorable Mention Best Motorcycle Product Of 2014, the pump ships in two varieties, a $69.99 pump or $79.99 Deluxe Kit that includes heavy-duty neoprene case, battery clips and battery terminal rings. If you don’t have any of the connecting options, the Deluxe Kit is well worth the money – with the case being a nice extra. 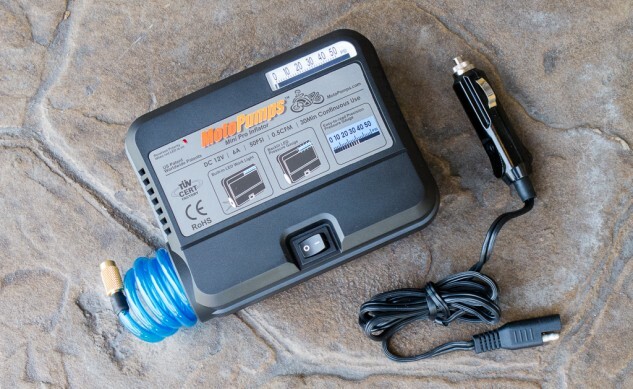 Having a plug wired to your bike makes the Mini Pro super easy to use. In my case, I already had a Powerlet Socket installed on my personal R6, so it’s become my go to power for the Mini Pro. 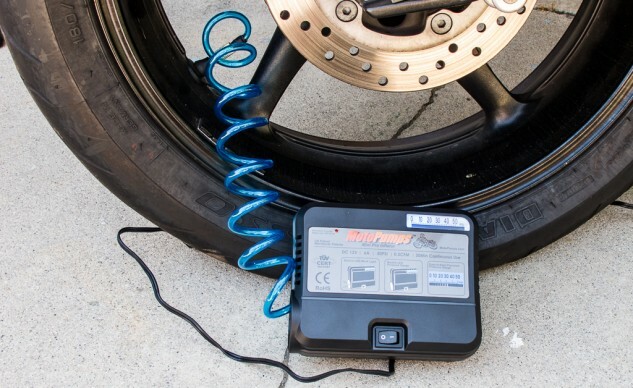 As a quick source for household and moto compressor needs, the Mini Pro has taken every task I’ve thrown at it: fill a completely flat motorcycle tire (a 190/50–17 rear tire from 0 psi to 36 psi in 7.5 minutes), various pool floaty rafts/toys, a handful of soccer balls at the beginning of coaching season, etc. The Mini Pro’s noise level is tolerable enough to use inside an enclosed space, like a car (with the aforementioned soccer balls), and the volume only increases slightly as the pump labors under an increasing load. When it reaches its 50 psi maximum pressure the Mini Pro draws a claimed 6 amps. Although I never pushed it to its 30 minute continuous use limit, I did have it run for a full 15 min., resulting in only a slight warmth to the plastic casing. The LED gauge is easy to read but reported a couple pounds more than was read by a gauge at the valve stem. This comes as no surprise since the scale of the gauge is quite small. Slightly overfilling tires and then adjusting downward with my known-to-be-accurate tire gauge has been the technique I’ve used over the years, so I have no issue with the Mini Pro’s accuracy. The Mini Pro’s LED light is useful when using the pump in the dark, though it sometimes requires a third hand to shine in the right direction. The 10 feet of cable is conveniently packaged but a hair tight if you want to take the cigarette adapter with you. For filling, you have the screw on valve stem interface, a needle adapter and two differently sized nozzles. After use, the coiled hose fits easily inside the compact 2 x 4.75 x 5.75 in. housing. The power cable and the cigarette adapter extension can be stowed inside the pump – with a little finesse. If you plan on using it as often as I do, you’ll probably end up leaving the adapter attached to the cable and storing it in the neoprene case’s main compartment with the pump. The other attachment leads remain in a smaller compartment. This convenient packaging does come at a cost since the entire setup consumes much more space than the Mini Pro alone. Since I have a Powerlet socket affixed to my bike, I’d just take the pump wrapped in a shop rag when touring. If you have room to spare, the case will give the most connection options out on the road. The pump’s 18 oz. weight is even less a factor when traveling than the size. Deluxe accommodations: The basics (Mini Pro and cigarette adapter) plus fused battery clips and permanent fused battery rings. 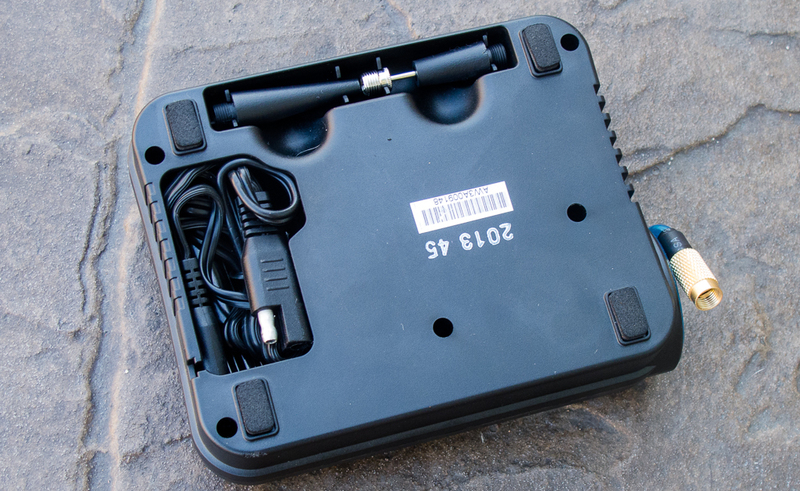 Although the case is good for long-term storage, the Deluxe Kit takes up significantly more room on a bike than just the pump and a single adapter. Over the course of a few months, the Mini Pro has moved from a good idea to have on hand to an indispensable part of my garage’s arsenal. The fact that MotoPumps made it small enough to easily transport when touring is a huge bonus. While the $69.99 pump alone is worth the price, the added items justify the $10 bump for the Deluxe Kit – even if you don’t need the extra connectors, now. 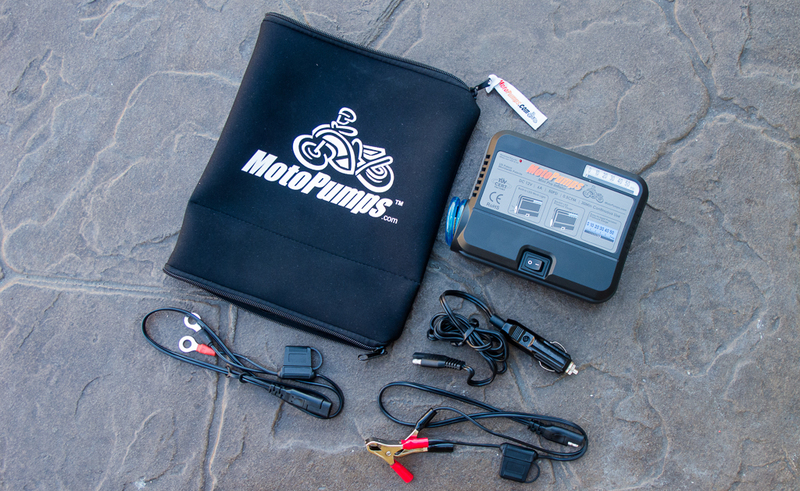 Visit MotoPumps’ website to order yours.